Roland Wentworth Bullen was born on Carriacou, one of the six islands that comprise the nation of Grenada. The product of a prominent family that owned several businesses, including the popular restaurant “Callaloo,” Bullen arrived in the United States in 1966. 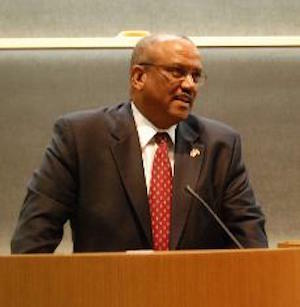 After obtaining his bachelor’s degree in public administration at San Diego (California) State University in 1971, Bullen earned a master’s degree in city planning at Alliant International University (formerly United States International University) in 1973. Bullen worked as an employee for the City of San Diego prior to joining the Foreign Service in 1977. Given his background and experiences in the region, during the first half of his diplomatic career Bullen was mainly given assignments in nations bordering the Caribbean Sea, namely Belize, Venezuela, Costa Rica, Colombia, and the Dominican Republic. From 1994 to 1996 he was in Washington, D.C. working in the State Department’s Office of the Inspector General (OIG). From 1998 to 2001 Bullen was Deputy Chief of Mission at the U.S. Embassy in Bridgetown, the capital city of Barbados. Also while in Barbados Bullen was Chargés d’Affaires for two years and, during this time, according to one State Department source, he skillfully handled “a series of trade, banking, money laundering, immigration and tax regulatory issues, and concluded Mutual Legal Assistance Treaties (MLATs) with all seven countries covered by the U.S. Embassy in Bridgetown” (St. Kitts and Nevis, Antigua, St. Lucia, Barbados, Grenada, St. Vincent and the Grenadines, and Dominica). By the turn of the century Bullen was the most senior envoy in the Eastern Caribbean region. Bullen returned to Washington, D.C., and from 2001 to 2003 he was Deputy Executive Director in the Bureau of Western Hemisphere Affairs (WHA) at the U.S. State Department. On February 28, 2003, President George W. Bush nominated him to serve as the American Ambassador to the Republic of Guyana. During his three-year term as ambassador Bullen tried once more to encourage the Guyanese government to allow the U.S. Drug Enforcement Administration (DEA) to establish its presence there in order to combat burgeoning narcotics trafficking. The illegal drug trade, combined with government corruption, was serious enough to prompt Bullen to express fear for his personal safety. Shortly before his term as ambassador expired in 2008, Bullen delivered to Guyana’s health minister $110,000 worth of pediatric antiretroviral (ARV) drugs, for distribution by the Guyana HIV/AIDS Reduction and Prevention (GHARP) project, funded by the United States Agency for International Development (USAID). He also promoted a plan to establish a chain of warehouses in the Caribbean, stocked with supplies that would alleviate the damage and suffering caused by seasonal hurricanes. In 2009 Bullen exited his final post as Chargés d’Affaires at the U.S. Embassy in Santo Domingo, Dominican Republic. In retirement with his wife in Barbados Bullen was a consultant for QBIC Group, an international market development firm. “West Indian Born Ambassadors in US Diplomatic Corp,” article at http://www.ecaroh.com/bmp/articles/wibornambassadors.htm; State Department release at http://2001-2009.state.gov/outofdate/bios/b/22869.htm; Wikileaks article at https://saveguyana.wordpress.com/tag/dea/.